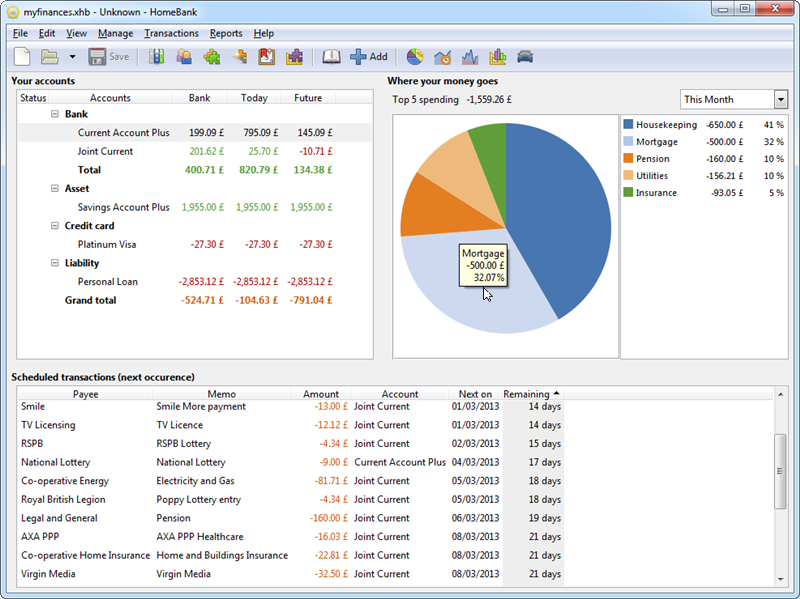 HomeBank’s summary screen makes it simple to see where your finances are heading. In these austere times, every last penny, cent or fēn counts. As households struggle to make ends meet, knowing where your money’s going is an essential part of staying in control of your finances. To that end, your computer is an invaluable tool, and you’ll find plenty of financial tools vying for your attention. The problem is, many of these tools cost money, which seems counter-productive during this tough period. Thankfully, there are some free solutions out there, and one of the best things about HomeBank is that it gets the blend between functionality and user-friendliness to perfection. The average household doesn’t need a complicated set of planning and budgeting tools, you just want to see where your money’s going. HomeBank delivers this in spades. It supports an unlimited number of accounts, allowing you to track current accounts, savings, liabilities and assets. Data entry is relatively straightforward, and the program supports templates and scheduled payments for frequently recurring transactions such as standing orders and cash withdrawals. Transfers between accounts are simple too, so however your income and expenditure stack up, HomeBank can stay on top of it. There are also a number of reporting and budgeting tools too, including various charting and graphing options – nothing too fancy, but easy to grasp and packed with enough capabilities to allow you to track your accounts whichever way you choose. If the program has one weakness it’s a lack of a decent reconciliation feature – reconciling your account allows you to match up your HomeBank file with cleared transactions in your actual accounts, but it’s very basic and not that helpful. On the whole, however, HomeBank is a very capable personal finance manager for the struggling household. You’ll be amazed at how much money you’ll save just by knowing how much you’ve spent – and in these hard times, that’s priceless. The Windows version of HomeBank is a native build, and includes an option for installing the Portable Edition if required. Mac users will need to install MacPorts, while Linux users will find instructions for downloading HomeBank through their distribution at the download link above. If you’re looking for a simple, unfussy tool to help you gain control over your personal finances, HomeBank is a great choice.